45 homeless veterans. This is a 10% decrease from last year’s total. Females make up 33.8% of the total homeless population and males 66.1% of the total homeless population. Children under the age of 18 are 14.2% of the total homeless population. Youth homelessness (ages 18-24) are 7.25% of the total homeless population. The largest decrease in subpopulation data from last year was for youth homelessness (41.2%) and children under age 18 (46.6%). The Point-in-Time Survey is administered at least once a year for the purpose of detailing information and characteristics about people experiencing homelessness in a shelter. 145 adults 18 and over completed the survey. A significant proportion of the homelessness individuals surveyed (58) have never experienced homelessness prior to their current situation. 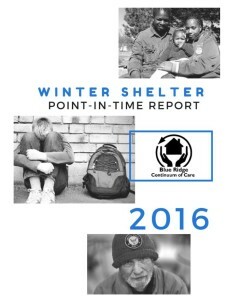 65.5% of those without homes were in the Roanoke Region when they became homelessness. This statistic has increased each year since 2013. This data from the Point-in Time Count and Survey provides insight into the experience of homelessness, highlights local needs, and can guide strategies to address homelessness. The results in the full report are valuable to area service providers, policy makers, and the general public. The collective impact approach and housing first model utilized by the Blue Ridge Continuum of Care continues to have positive outcomes. The results indicate progress and a decrease in homelessness in our region for the fourth consecutive year. Since 2012, there has been a 41% decrease in homelessness (2012: 561; 2015: 331). The number of individuals experiencing homelessness has not been this low since 2003. Blue Ridge Continuum of Care and its partner agencies should be applauded for their efforts and considerable strides! We have a dedicated, passionate, thoughtful group of individuals who are determined to end homelessness in the Roanoke Valley.